I went to my appointment today and all was fine so I'm waiting until Tuesday afternoon to have the baby. The doctor encouraged me to take it "very easy" so I guess I'll do my best to rest and relax over this holiday weekend. Today I went in for my last non-stress test and biophysical profile. I've been going once a week for the past 6 weeks because of my blood pressure issues just to make sure everything is fine with the baby. Of course the biggest problem women with high blood pressure face is having tiny babies, so I think we can all safely assume he hasn't been affected by it in any way. Anyway, the biophysical profile includes an ultrasound and today they found something kind of funny on him: fat rolls! They could already see hair on his head a few weeks ago so I'm starting to think they're going to pull a toddler out of me next week. I thought tomorrow might be a possibility for having the baby since I had an OB appointment scheduled in the morning, but I just heard that my doctor has jury duty and I've been rescheduled for Friday. So unless I go into labor before then or have really high blood pressure on Friday, I'm guessing I'll make it to my originally scheduled c-section on the 2nd. Gary and his friend Chris took Emmylou and Chris' daughter Emory to the circus this afternoon. Gary didn't get great photos but they all had a really great time. This morning Emmylou did and said something so funny that I'm surprised my water didn't break from laughing so hard. [Squealing] "I pulled Daddy's tail!" Needless to say, we had a little talk about human anatomy after I caught my breath. Hoy fue el dia ultimo de las clases espanol para Emmylou. Comprende? Probably not, since I'm drawing on my pathetic broken Spanish skills from my undergraduate days at UT and I don't know how to type using accent marks (can anyone enlighten me there?). Anyway, in English, today was Emmylou's last day of Spanish class and Tripp's mom sent me a couple of photos. Here she is with Ava, Owen, Tripp, Ellie and Dylan and her teacher Jorge. I'm not sure how much Spanish she learned over the last couple of months (I asked her how to say "thank you" and she said "adios"), but I know she had a really good time. Today Jorge made some ice cream as a special treat for the kids. This afternoon I had another ultrasound where they measured the baby and he came out at a whopping 9 pounds, 6 ounces! Now I'm really wishing my OB had given me the go-ahead to have him today! Although I keep having flashbacks to a TV show I once saw on TLC called "Archie, The 84 Pound Baby" (among my other favorites: "I am My Own Twin" and "The Man Whose Arms Exploded"), the good news is that once this baby comes out, that's already 10 of the 50 pounds I'll need to lose! 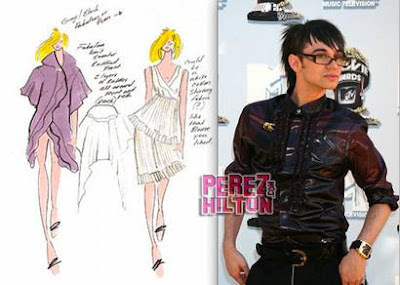 Christian from Project Runway is launching a maternity line! A Moody Mamas rep told us he signed on because he thought it would be great for a gay man to team up with two women who've never had a baby to do maternity clothes. Too bad it's too late for me now, but I'm sure pregnant women of the future will be thrilled to be covered in feathers and layer upon layer of ruffled silk chiffon! A few people have asked for a photo of me and my belly these days, so I hastily took a couple after my appointment on Friday when I thought the end was near. 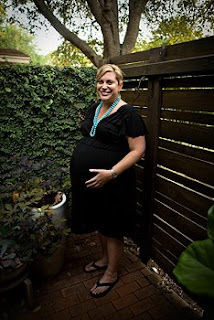 I hadn't realized that I hardly had any photos of me during this pregnancy! It wasn't intentional but as you can see, it should've been-- I'm cringing at how huge I am! We almost had a baby today! This morning I had my OB check-up and when I got there my blood pressure was really high. So my doctor sent me to Labor and Delivery and told me that it was very likely that she'd deliver me this afternoon or evening if it didn't go down! After Gary and I picked our jaws up off the floor (he and Emmylou had come with me this morning so he could finally meet my doctor), I spent a couple of hours in the hospital and it went back down to the normal range. I was sent home and put on bedrest until I see my OB again on Tuesday. She said the only reason she didn't go ahead and deliver me is that the baby would still be considered premature by three days. Had he already been 37 weeks (which he will be on Monday), we would've gotten to meet him today! So it'll be a quiet weekend for me (yay, lots of Olympics watching!) but if anything exciting happens, I'll try to keep everyone posted here. "Mommy, you're in a cage!" Today you turn 29 months old and I certainly wasn't going to miss writing to you since this is your last letter from me before your brother gets here! While I'm so excited for him to come and I can't wait to watch your reaction when you meet him for the very first time, I can't say that I'm not also a little sad that our relationship is bound to change in some way. Will you be angry at me or jealous of him? Happy and helpful? Probably a little (or a lot) of each. All I can tell you is that I couldn't love you more than I do right now and I'll never love you any less, so we'll just have to see how it goes and take it one day at a time. A new adventure for all of us! I think in the last letter I wrote to you I talked about how my major role in life was to act as your translator. Well, that's much less necessary these days. Yes, you have a few speech issues (you still don't say any 'k"'s or "g"'s) but the sentences you put together are so well-worded and complex that most people can understand you in context. I am constantly amazed at the difference in your language over the past few months! You are into telling stories and making up songs and your imagination is starting to run wild. This morning you were pretending that a dinosaur was coming to get you so we snuggled and hid under the blanket until it went away. Your favorite book this past month has been "Goodnight Lulu." You've almost memorized the entire thing! Lulu is a chicken and you think it's hilarious that you guys have the same name. You point to her and say "That's me!" As far as TV shows go, you're still onto Max and Ruby and The Wonder Pets. Awesome, because I can never get enough of those. This past month you've been really into taking bubble baths, which always seem to lead to a rousing game of "Naked Baby." After your bath (and also usually before), you love to run around the house naked, you and Daddy singing "Naked Baby!" over and over. You both think it's hilarious while I'm a little worried that we might have a future nudist on our hands. You still love to play hide and seek and your friends are really important to you right now. You always talk about Tripp, Ellie and Sofia and you tell me that you miss them when you haven't seen them in a day or two. We just finished our music classes with Ellie and Tripp yesterday and next week is your last Spanish class with all three of them. Then it'll be time to start at your new school and fortunately, they're all going to be in your class, too! I am so happy that this month you've finally gotten over your aversion to having your picture taken. I swear, for awhile now you've acted like I am committing child abuse whenever I try to snap a photo of you. Well, it's quite the opposite now. Somehow you've gotten over it and you ask to have your picture taken all the time. You'll even say something like, "I look so cute! Take my picture, please!" Last night Em was over here and saw this change in you for herself. She asked you if you wanted to be on TV or in movies and a huge smile came across your face and you said "Yes, please!" Yikes... No child stars in this family, please. Anyway, I just wanted to let you know that I've tried really hard this summer to do lots of things with you since it was the last of our time together by ourselves. Yes, you're a little wild and crazy sometimes and it's been hard keeping up, but I've enjoyed every minute and will never forget what fun and love you brought me these past two years. Please don't hate me when this baby comes. Last week Emmylou's friend Tripp came over to play. His mom and I like to call them "Frick" and "Frack"- they are basically the same kid in male and female form. Of course it was too hot to let them play outside (okay, too hot for me to supervise them outside) so we brought the slide in and let them play on that. More fun, though, was jumping on the couch. Today I used a pair of tweezers to pick a doughnut sprinkle out of Emmylou's right nostril. Sorry, no photo available.